Everyone is welcome to our first public orienteering event at Eno River State Park, on Sunday, 18 February. Registration will be at the Fews Ford shelter, just west of the loop parking lot at the end of Cole Mill Road. (GPS coordinates = 36.073616, -79.007005). IMPORTANT: DO NOT PARK IN THE LOOP PARKING LOT. Instead, just before getting to the parking lot, turn left (look for the BOK sign) and follow the park’s service road for approximately 200 meters. Turn around on this road (busses can use the turn-around loop), and then park on the right (south) shoulder. Doing this will keep us in good graces with park management, and will not significantly impact your walk to the start. See the Figure below for a map of the parking and registration area. If you’re coming in a group of 5 or more, please pre-register here to help streamline your registration process, and to help ensure that we print enough maps. If you’re coming solo or in a smaller group, you can optionally save a bit of time at the registration table by filling out your entry form, available here, before you come; although you do not need to notify us that you’re coming. Whether you register online or in person, everyone should turn in their entry form (also available at the event) and start their course any time between noon and 2:00. If you’re new to orienteering, please arrive in time to get signed in before attending our beginner’s class at 12:30. Make sure that you report back to the finish by 3:00, because we will begin picking up all of the check points (controls) at that time. 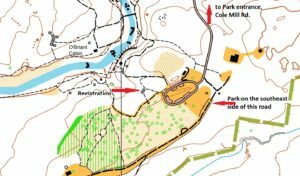 In addition to a full set of standard point-to-point orienteering courses, we will offer three Radio Orienteering courses. 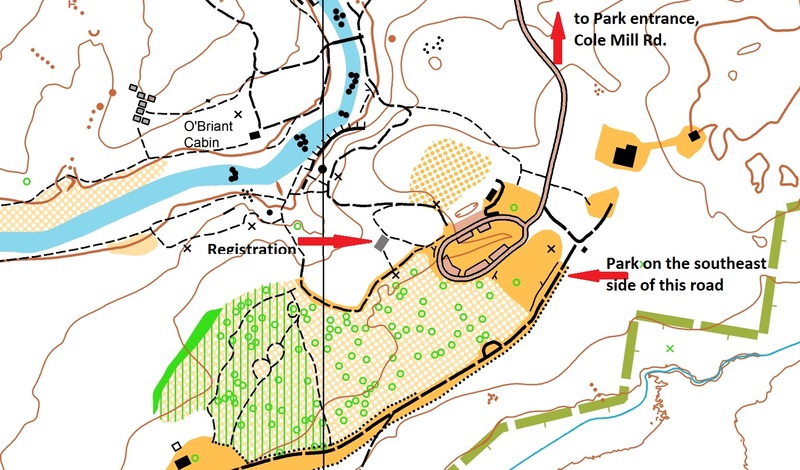 First we will have a demonstration course for people who are interested in trying this variation of orienteering. This short course will let you try the basics and shouldn’t take more than about 15 minutes. In addition to the demonstration we will offer a short and medium FoxOring course. FoxOring Radio-O courses minimise the frustrations of both Orienteering and Radio-O. First of all it is a Score course, so you can take the controls in any order. You navigate toward the circle marked on the map, when you are about 50m from the transmitter you can hear the signal, and you use your radio receiver to locate the transmitter which could be up to 40m from the location of the circle on your map. We hope you will give Radio-O a try. We have some excellent receivers for you to use. You should bring your own headphones or you can use the ones we have. Unless the river level is dangerously high, competitors on the orange, brown, green, red, and FoxOring courses should plan on at least one wet foot crossing of the Eno River. The water should not be more than calf-deep, and will come toward the end of the course. The scale of the map for the beginner and intermediate courses will be 1:5000. For the advanced and expert courses, it will be 1:10000. A few notes about Eno River State Park and its new map are available from this PDF document: EnoRiver-VenueandMapNotes. Participants on all courses except beginner (white) are advised to wear leg protection.